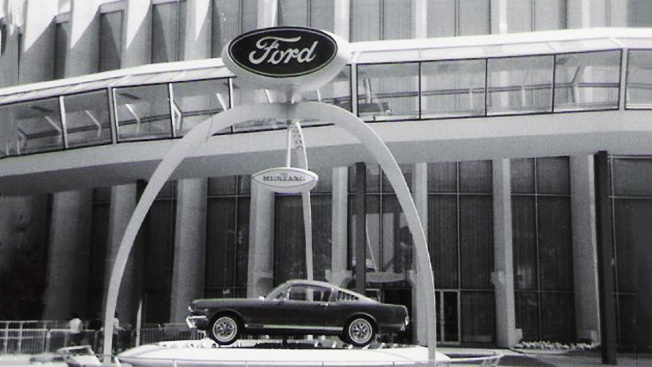 Ford also mentioned that the Pony Car had made its debut out in Queens, at the 1964 World’s Fair. But what he didn’t say was that Ford Motor pulled off another high-altitude marketing stunt out there, too. In fact, the World’s Fair exploit was far more memorable than yesterday's exhibit (no disrespect, ESB): If you'd gone to the big fair 50 years ago, not only could you sit in a new Mustang, but ride in it—high over the heads of your fellow fairgoers. In all, 160 Fords circled the track in the Magic Skyway, including the Galaxie 500 and the Falcon Futura. You had to be lucky for the Mustang to roll by when it was your turn. But the thousands who took that first ride in a Mustang convertible never forgot the experience—participatory marketing, if you will.